When I'm working on a necklace making project for myself, I have to pay attention to the length of the finished necklace. I recently realized that I have quite a long neck for someone who is so short, so when I wear very long necklaces (like lariats or opera-length pearls), I sort of look like a very short giraffe. That explains why I tend to gravitate towards shorter necklaces for myself like chokers or princess length necklaces. Figuring out the perfect length for your necklace making projects can be a challenge, but there are a few things that you can do to get the perfect fit. My Back to Byzantium necklace can easily be adjusted to any length, thanks to the herringbone tubes on either side. String extensions onto pieces of bead-weaving for a longer necklace. Use a pre-made extender chain (or make your own). Use a detachable extension that can double as a bracelet to adjust the length of your necklace. Don't forget about the clasp. The length of the clasp will add length to your necklace making project, so remember to include that in your calculations. 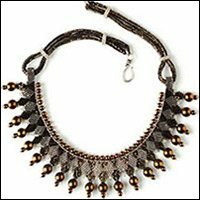 You should also take into account any kind of seed bead loops that you may have to make to attach your clasp to the necklace you're making. All of these things can add to the finished length of your beaded necklace. Use a dressmaker's dummy. I've seen lots of serious necklace making done with the aid of a dressmaker's form to get the sizing just right. Some of you might remember the fun television show, Project Accessory. I love the way those accessory designers used the dressmaker's form to judge just how long their finished necklaces were going to be. Using a dressmaker's dummy also helps if you're trying to assemble a more elaborate necklace making project that's composed of several different components. When am I going to wear my necklace? When you're working on your necklace making projects, think about when you might wear the necklace or with what kind of clothing it will be worn, too. Each different necklace length is better suited for a different type of necklines. The clothing that you wear with your beaded necklaces is important, too. Do you have a favorite neckline for your shirts, blouses and dresses? In the winter, I wear lots of turtleneck shirts and sweaters, so something like a choker wouldn't be very comfortable. But a longer lariat, beaded rope, or even a large bead embroidery collar would work very well with my favorite winter turtlenecks. Summer means lots of scoop and v-neck tops, so that's when I wear my collection of light and delicate chokers and princess length necklaces. Ready to find some new necklace making projects? Check out the back issue sale in the Beading Daily Shop! Through July 21, 2012, all back issues (including special issues like Favorite Bead Stitches 2011) are on sale for 50% off! Stock up on any issues of Beadwork magazine and Jewelry Stringing magazine that you might have missed, complete your collection, or start your digital magazine collection with instant downloads. 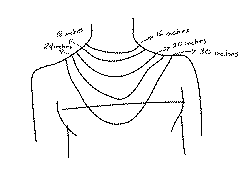 What are your favorite tips for sizing when you're making a necklace? Do you use a flexible cloth tape measure when checking the length of your necklace, or do you lay everything out on a flocked bead board? Share your tips, hints, and advice for perfect necklace making lengths here on the Beading Daily blog!